"jQuery Migrate" is a Sink, too?! or How "jQuery Migrate" un-fixes a nasty DOMXSS without telling us..
"@0x6D6172696F Does anyone know why jquery.com has a special jQuery 1.9.1 version that is still vulnerable to $(location.hash)?" What happened after that message might be considered to be the discovery of a rather interesting bug - which Mario and me will try to wrap up in this joint blog-post. an official jQuery plugin un-fixes a long-gone DOMXSS bug and brings it back - even on the jQuery homepage itself! "Some days ago, while being engaged in a workshop, I discovered a funny thing. 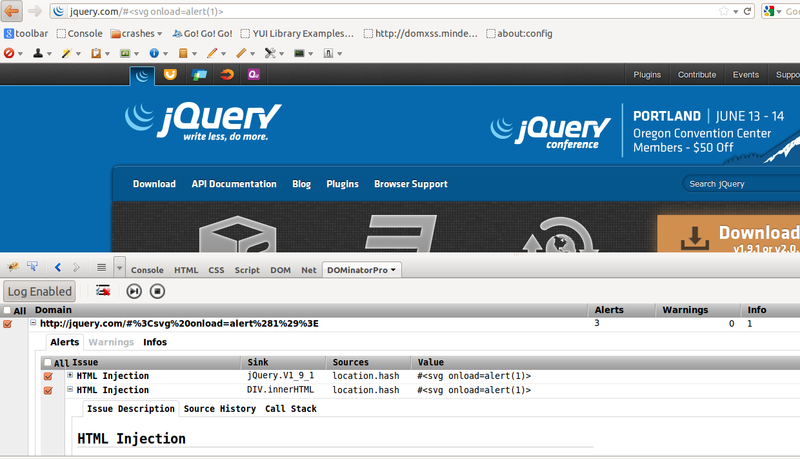 I visited the jQuery.com homepage and tried playing around with the DOMXSS jQuery came shipped with some months ago. The one, that could be exploited by allowing arbitrary user input to the $() function - remember? My goal was to demonstrate the attendees, how the XSS worked, why it worked and how it was fixed. So, I wanted to test if there's still ways to activate it and get past the regular expression they installed to mitigate the bug. First thing was to try the obvious, set location.hash to <svg onload="alert(1)"> and execute $(location.hash) via the Firebug console expecting it NOT to work. Admittedly confused, I checked the jQuery version they deployed and it was the latest - jQuery 1.9.1. That couldn't be - I must have made something wrong! I decided to build a small dynamic checker to see which exact version of jQuery is vulnerable to this bug, and which is not. The tool I created - really ugly code, be warned - is here. jQuery 1.6.2 was the last vulnerable version. And 1.9.1 is not! So, what did the jQuery people do? Why is their latest version vulnerable but the actual version isn't? How did they get their version to be buggy again? In my desperate helplessness I tweeted and Stefano replied. He found the cause for this quirky behaviour of eternal madness." Now, Stefano (me:) had a deep look into the code and started the engine of... well, you know it, DOMinatorPro to see what kind of roguery is going on here. "Since the day I started to develop DOMinatorPro and write DOMXSSWiki I thoroughly studied jQuery internals in its very own, so when Mario tweeted about that, I immediately thought about some weird misunderstood mixed jQuery version behaviour, as sometimes have happened to me. ..and the version info indeed clearly says: 1.9.1!!! You can easily check that via $.expando by the way - no need to dig in the site sources or script code itself. // Note this does NOT include the #9521 XSS fix from 1.7! // This is an HTML string according to the "old" rules; is it still? So, by looking at the oldInit.call what happens here is that another jQuery sink is called (!) and that's jQuery.parseHTML." It's probably a way to give back compatibility by recreating the old behavior using parseHTML, but jQuery guys forgot that there are two fixes that try to patch a wrong design choice, and the first one comes from Version > 1.6.2. These include the dreaded DOMXSS from Mala. Can it be worked around? The fix is - and that is Mario speaking again - extremely dirty and everything but production ready. But it shows a way to make sure the location.hash cannot be abused to cause DOMXSS on your precious website. But you get the gist - make sure that if you use the jQuery Migration plugin that your web-app stays safe from DOMXSS. ..and, of course, feel free to improve it and paste it in a comment. Also, greetings to the fellow attendees of the jQuery UK conference that is happening right now.